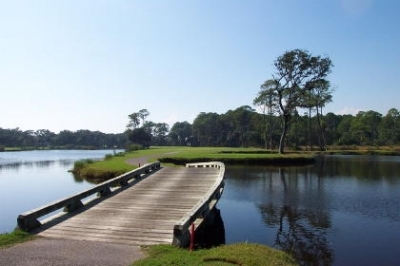 SEA ISLAND, GA -- It's safe to say, there's a lot that goes into every sports success story. We've all seen it -- individuals and teams excelling, winning awards, tournaments, competitions, trophies, etc... It's easy to get lost in the hoopla, with their smiling faces gracing the covers of newspapers and magazines. They're the headliners, the winners, the leaders of the pack -- and they deserve the attention. But invariably, there's always the 'supporting' cast that helped that person or group get where they are. People like the scout team wide receiver who stays late to run patterns and catch passes from the starting quarterback; or the parents who take their kids to hockey practice at 4:30 in the morning, then sharpen skates to make sure they'll get the most out of their workout; or how about the guys 'on the bag' for professional golfers? Caddies take on several different roles -- marking off yardage, pulling clubs, raking the sand, acting as fill-in swing coach, admonishing the crowd, or providing critical psychological counseling in the player's time of need. They're members of a player's 'team' in a sport that's decidedly individual in nature. They rarely share the glory, but are essential for the player's success. They're the 'unsung' heroes of the moment -- and sometimes, your best friend. Or perhaps even your brother. Such is the case for Mark Love, brother, part-time caddy and golf course design partner of PGA Tour professional Davis Love III. Davis has certainly torn up the PGA Tour in 2003, winning three times and currently leading the tour's money list. For Davis' victory at The Heritage (concluded in a playoff on April 20th at Harbour Town Golf Links on Hilton Head Island, South Carolina), Mark walked beside him every step of the way -- as he has for many of Davis' greatest triumphs in an 18-year Tour career. We're all familiar with the Love family story -- one written in golf history, with Davis Love Jr. being the famous teacher, father and player, who tutored his boys in the proper way to play and respect the game of golf, then dying tragically in a plane crash in 1988. We've watched Davis III's playing career, winning the PGA Championship in 1997, taking part in all those Ryder and President's Cups and seeing his name frequently on leader boards. And we've also seen Mark, though perhaps not as prominently in front of the cameras. Mark's played a supporting role in Davis's playing career, but currently works alongside his brother at Love Enterprises, and together they're designing golf courses that will expand on the Love family legacy for generations to come. GTMA: Congratulations on your successful tournament at Harbour Town. It was amazing to see Davis win there for the fifth time, and seeing him sink that dramatic shot on the 72nd hole to get into the playoff. After he made it, he gestured towards you -- what did he say? Love: Well, he basically had just called that pitch. I'd been telling him to pitch it in on every hole, because he kept missing greens on the holes leading up to the end -- and it looked like several of those were make-able shots. Then he got to 18, and we were walking up to the green, and he said, "You know what, I'm going to pitch this one in," and sure enough, he did. So that kind of got him pumped up, and the crowd was going crazy. The whole week, we just had a good time -- picking clubs and hitting shots and it was very low stress. It was like a vacation week, it was fun. GTMA: It must've been exciting, especially now that you're no longer caddying for Davis that much. How did you originally get into caddying for your brother, and why did you decide to 'leave the bag,' so to speak? 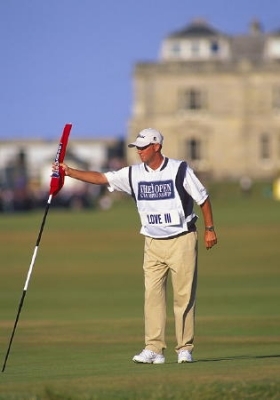 Mark Love tends the pin at St. Andrews during the 2000 Open Championship. Photo By Larry Lambrecht. 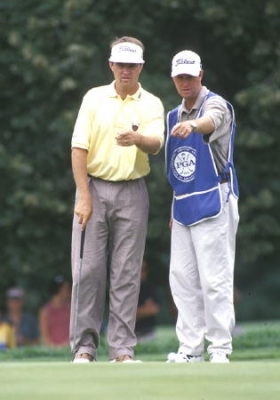 Love: Well, looking back, I first started caddying for Davis full-time in 1992. Davis had had a pretty good year in '91, but not great, and I was doing some teaching at the time. He said that he'd been paying his caddy about three times what I was making as an instructor, and that I could do at least as good a job as he'd been doing -- and help him with his golf swing at the same time. I'd been working alongside his swing coach, Jack Lumpkin, so I'd be able to help keep him on track while we were on the road. I thought 'hey, this is great.' I was single at the time, so I certainly had the time to do it. 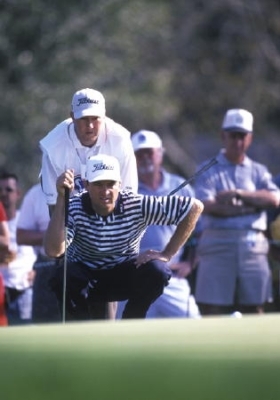 It turned out that '92 was Davis�s best year ever -- he won the TPC and two other events. He actually won six events overall that year, including three on the PGA Tour. I caddied full-time for about six years, then we started getting a lot busier with the design company, and I'd gotten married and we had our first child in '97 -- so I gradually started reducing my schedule on Tour. In 2000, I did seven events, and four of 'em were majors, two were World Tour events, and the other was Tiger's tournament out in California. At that point, we decided that if we were busy enough that I was only going to caddy for him six or seven weeks a year, it didn't make sense from a continuity standpoint for him to have a full-time guy who wasn't working on the most important weeks of the year. So I reduced the schedule to five or six 'fun' events after that, and now I'm down to doing two events a season -- one of which was at Harbour Town. GTMA: It must've been a thrill to get a win on the odd week out. But you've certainly witnessed a lot of great moments, including the '99 Ryder Cup victory (at Brookline Country Club in Massachusetts). What was that like? Love: It was incredible, just being a part of it. Ben (Crenshaw, the US Captain) truly made all the caddies feel like part of the team. So it was great being there -- playing a small part, but still a part nonetheless. I'd been on two losing teams prior to 1999, so after the first two days, I thought I was going to end my career without a win. I was assuming that it was going to be the last time I was going to caddy in a Ryder Cup, and it was going to be pretty disappointing to be on the losing side three different times. In our match, we'd gotten a pretty big early lead on the Frenchman, Jean Van de Velde -- Davis was playing great golf, and just wearing him out. So I was able to watch the board and see what was going on, and listen to the cheers, and not feel a tremendous amount of pressure in our match. And that was probably the greatest part of it, watching those American flags go up on the board, then riding around on the back of a golf cart, with Michael Jordan in the front seat, and seeing how the momentum just kept rolling. It was just a neat experience to be with those players, in a truly historic moment in golf. I'll never forget it. There's more to a caddy's job than just toting the bag. Photo By Larry Lambrecht. 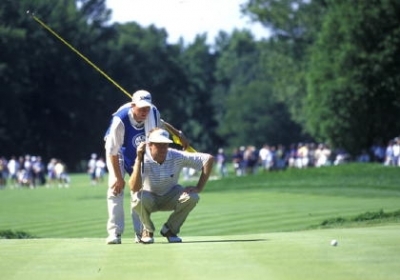 GTMA: Speaking of 'moments,' one I'll never forget was Davis' victory in the 1997 PGA Championship. The difficulty of the greens at Winged Foot, the rain during the final round, then that rainbow at the end. What was your mood like during the tournament? Love: I was nervous, but sort of excited. We (Davis and Justin Leonard, in the final pairing) were far enough ahead of the rest of the field going into the last round that you might've been a lot more nervous if you'd actually had the lead all by yourself -- because then, everything would've been about trying to keep the lead, and you would have been a little more tentative. So he went in with a lot of confidence and poise. And being friends with both Justin and his caddy at the time, it didn't have as much... I know a couple times at The Masters or the US Open, we'd gone in, and felt a lot more anxiety about the round. The '97 PGA was more fun -- it was like, we want to win, but it's Justin, and we're going to have fun with him on the golf course. And if he wins, we're going to be happy for him -- at least that's the way I was looking at it. GTMA: Was the 'lighter' mood the difference? Love: Obviously we went out there trying to do everything we could to play the best we could and win, but the atmosphere was... friendlier, and didn't seem as all-important as some other tournaments had to me. The ones where it seems every shot might tip the balance. I guess it was because there was the lead, and the kind of match-play situation, that you knew at the end of the day, if you outlasted him, you'd have it. Usually you've got to worry about so many guys coming from behind, and who's doing what -- and in the situation that we had at Winged Foot, it's a little different. GTMA: It must've been difficult, from an emotional standpoint, to finish out the round in the rain, then having that rainbow appear at the end. I know the TV commentators were talking about how it was a 'sign from heaven' that your father was watching. We were just trying to finish off the tournament and get in. The last hole and a half was so difficult at that point, that you realize that all you need to do is get it in, and you want it. You start, sort of projecting forward to all of the emotion, and the excitement of having accomplished winning a major championship. But you've still got to get there. So we were just fighting so hard to try and keep ourselves in the moment, and playing one shot at a time. Mark and Davis Love -- brothers, teammates. Photo By Larry Lambrecht. GTMA: Did you tell him that? Love: No, no. I just tried my best to not let my emotions show, to not let my demeanor change, so I could help him do the same -- and still try to bring up a little bit of conversation and keep things light, and then try to focus on each shot as normally as possible. Davis and (sports psychologist) Bob Rotella and all those guys are always talking about 'staying in the moment.' As soon as you start thinking about the result, and all the things that come with it, that's when bad things can happen. GTMA: Looking back, do you think the rainbow was a sign from your father? Love: Oooohh, I don't know. (chuckles) You'd like to think it was. I think the romantic view would be that it was. It's hard to say. But either way, I would think my father was certainly looking down with pleasure and pride in those accomplishments. GTMA: Switching gears a bit, you've talked about your role as a caddy to Davis. But when you're out there, is it more like brother-to-brother, or is it strictly professional? Love: Now it's more like brother-to-brother. When I was doing it full-time, by necessity it was a little more like caddy/player/boss. It had to be that way. He's always been, no matter who's worked for him, a great guy to work for, because he's the kind of guy who takes responsibility for his play -- and there are plenty of guys out there playing that are looking for any excuse to explain away mistakes. GTMA: You mean, he wouldn't say it was your fault that he pulled driver on the 3rd hole at Augusta? Love: Even Tiger (Woods) at the time said, it's ultimately the player's responsibility to decide how to play a shot. But, Davis wouldn't have made the first step and said "My brother talked me into driver." He would've said, "I decided to hit driver..." and he might even say "We decided to hit driver, but it was a bad decision and ultimately, I knew better." And that makes it easy for a guy to work for him, because you have the confidence to say what you think out on the course and give him your opinion. Everybody's going to be wrong every now and then. But you don't want a 'yes man' and you don't want a guy who's never helping you -- otherwise, you might as well not have him out there. A second pair of eyes helps you see what you might not have noticed. Photo By Larry Lambrecht. GTMA: Has there ever been any kind of a sibling rivalry between you and Davis in your various golf travels? Love: Not really. There was a little bit growing up, but we always played in different age groups, and competed against different people, so there really wasn't a lot of that. As youngsters, we kind of battled it out, but as we grew a little bit, and got into competition in different age groups, I think we kind of just pulled for each other and didn't really compete against each other that much. And I'm playing just about as well as I ever have right now -- but I realize that I'm still nowhere near where I'd need to be in order to compete with the guys at Davis's level. It's phenomenal how good those guys are. GTMA: As a caddy, is it your responsibility to know the player's game as well as he does? Love: Yes. You've certainly got to know what a guy's tendencies are. You've obviously got to know the distances that his clubs go, and how his ball flies into the wind and a crosswind. If you're truly going to help him, you've got to do more than just give good yardages and get out of the way. You've especially got to be able to help him make the hard decisions -- when there's a breeze to deal with, or a carry that's marginal. And you've got to recognize when changes happen in them. A 160 yard carry on Thursday morning is a different matter than the same shot on Sunday afternoon in contention. He'll be in a different frame of mind, and it depends on how well he's hitting it -- how excited he is. GTMA: Is it more important for a caddy to be technically correct, or for the player to believe he can execute the shot? Love: Definitely more important for him to believe it. I get a chuckle when I hear some guys talk about one yard here or there from 170 yards, or even 130 yards -- you know, it was 131 yards, not 132. I'm just not buying it. Ben Hogan kind of started that, and there're guys that truly believe that it makes a difference. But I can promise you -- if you make an eight-yard mistake, then you're going to see it and the player's going to know it. But he's not going to hit one 132 yards and you gave him 131 and have him say "you know, that was off." It's just not that perfect a game. 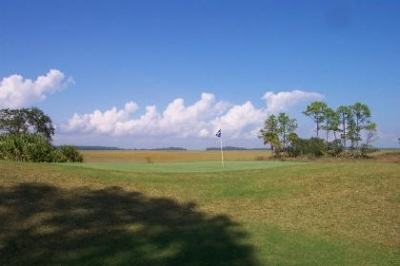 Fripp Island's Ocean Creek Course in South Carolina was Love Golf Design's first project. Here, you see the designers have keen eyes for form and landscape. So it's more important that he feels confident with the numbers and can execute the shot that he's picturing with the numbers that you gave him. If you're close, he's going to be fine. GTMA: Speaking of numbers, you're almost a decade into the golf course design business. What were your motivations behind wanting to design golf courses? Love: We've always been interested in course design. As kids growing up and playing the game, we doodled on napkins and designed our own golf holes. Dad was also interested in it -- he had a hand in building Atlanta Country Club. And I think Davis has learned a lot about it from talking with some great designers, like Tom Fazio and Pete Dye -- playing their courses and visiting with them. Then Rees Jones built Ocean Forest here at Sea Island, so he was out there a lot with Rees, you know, picking his brain and talking about things, and learning from the way Rees did things. Tom Fazio renovated a course here, so it was much the same with him. He's taken the 'parts' that he's learned from these gentlemen, and just like you'd take parts from different golfers over the years that helped shape your golf game -- he takes the parts he likes from the others and incorporates them into what he wants to see. And that goes back to Donald Ross... he's really interested in studying the things that the classic designers like Ross and McKenzie and Tillinghast did. GTMA: It probably doesn't hurt that you both have a 'world' of experience. Love: Well, one of the benefits of being a top touring pro is the ability to travel the world and see all kinds of golf courses. Basically, we'll walk out on a site, and something pops into his mind and he says, "You know, this reminds me of Shinnecock (Hills), or this reminds me of such and such a golf course." That kind of shapes what we need to do with a special circumstance. GTMA: Is golf course design something Davis wants to do more of in the future, when his playing career winds down? Love: Well, Davis started playing so young, and he's played so long, that I think he got into the design business because he wants to give a little bit back to the game and enjoys that aspect of it. As a company, we definitely want to grow to be one of the top design firms. When the Nicklauses and Palmers have kind of wound down, we want to be part of that next generation, and we want to have it available for him to do as much or as little as he'd want to do. 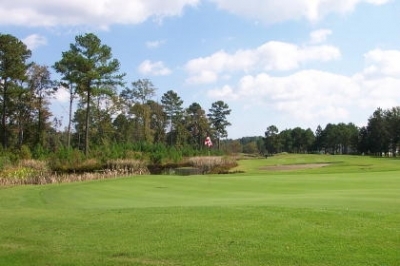 Eagle's Pointe in Bluffton, South Carolina was the Love brothers' third project. Another playable, fun track. We always want to stay small -- we're never going to do a big load of projects, because Davis likes to be personally involved in each one. Now, he's obviously committed to his playing career, so we keep the projects to a minimum because he doesn't have the time to do more. But we want to build the company to the point where -- when his playing career is winding down, he'll still have the opportunity to do two or four or six a year, whatever he wants to do. GTMA: Do you think Davis's recent success on Tour will impact your course design business at all? Love: I think it will, but it's probably more of a long-term thing. I don't think we've ever seen that there's immediate reaction to a win, necessarily. Hiring an architect is such a big step for people, and no matter what, they're going to go through a process of interviewing and looking at different firms. But I think what his Tour success does, is give us the kind of exposure that, when we go to the next interview, and we're competing against a Palmer and a Nicklaus and a Fazio and a Weiskopf -- it helps us move up the ladder a bit. So it's more of overall image thing. And that will, along with the projects we've got under our belts now, and the ones that are coming out this summer -- it'll continue to help build that 'brand' -- Love Golf Design. It'll let people know we're striving for the same kind of excellence in our designs that he's always shot for in his playing career. And I think we're starting to establish that kind of reputation in the industry. GTMA: What projects are coming out this summer? Love: There are three, and we're excited about all three of 'em. I don't know which one I'd say is going to be the best of the three, but I think they're the three best projects we've done to date. I just feel like we keep getting better every time out. We're redoing the course where they're playing the Greensboro Open at Forest Oaks. We've got a new project in Greenwood, South Carolina that will open late summer, and the other's in Valdosta Georgia. And then we've got a bunch of things that are in the planning stages -- some that will start, hopefully, relatively soon -- some at the end of this year, and some in the spring of next year. One can only imagine there's quite a lot in the planning stages for the Love brothers and Love Enterprises. And if Davis continues to clean up on Tour like he has of late, it'll only draw more attention to the golf courses they're working on. The 6th hole at Ocean Creek, right along the marshlands. Perhaps it's fitting, because it brings appropriate notice to Mark's contributions to the good family name. As President and CEO of Love Golf Design, he's ready to forge a reputation of his own. It'll be just another feather in the cap of one of America's greatest golfing families. Here's a look at their third project, Eagle's Pointe, near Hilton Head. And for a broader sampling of photographer Larry Lambrecht's excellent photographic work, try his website: www.golfstock.net. For more information on Davis Love III, I suggest you access the PGA Tour's Website: www.pgatour.com.